The First 5 Alameda County Conference Center is a state of the art facility that is open for use by our partners and other local organizations. The newly renovated spaces accomodate up to 118 people and can be arranged in numerous different configurations using modular tables and chairs. Available Equipment: Drop down projection screen, projector, (6) wireless mics and (1) podium mic, conference center computer, laptop computer, wireless mouse and keyboard. 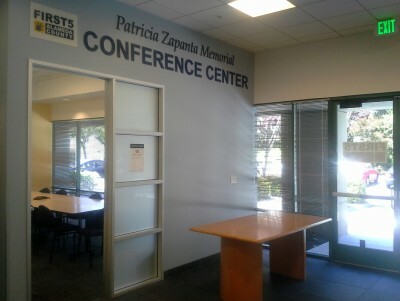 Our conference center features its own private entrance along with parking/loading zone. 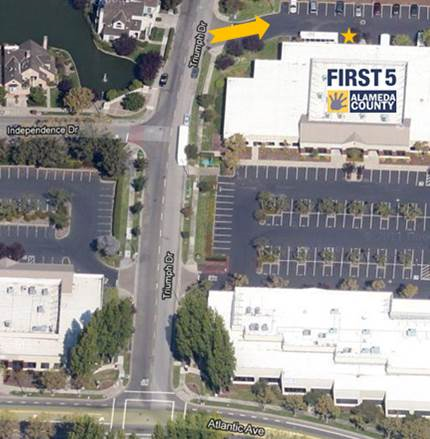 The map below shows the Conference Center Entrance (star) along with the parking lot entrance (arrow).